What effect will IoT have on the mobile sector? The internet of things (IoT) and the advances its brought to machine-to-machine (M2M) communication continues to be a hot topic in tech circles. Why's that? Well, not only does IoT represent a burgeoning market segment in itself, it is also promising to radically alter a host of existing sectors as technology in the field advances. Among those is the mobile market, and to hear more about how IoT and M2M growth will impact the sector, we spoke to Three UK's Head of Business Development, Tom Gardner. TechRadar Pro: Where do you see M2M and the internet of things going in the next five to 10 years? Tom Gardner: Whether you call it M2M or the internet of things it will continue to grow at a substantial rate. Experience has taught us all to be wary of some of the hype, but a fundamental change that will accelerate growth is the falling cost of the hardware for connectivity and the appetite for data. In the consumer world, a business case can be made for almost any device to be connected. Whether that business case be based on market differentiation to deliver a richer customer experience or simply for the manufacturer or retailer to learn more about the way the device is used to support R&D and or to reduce customer support costs as faults can be remotely diagnosed, pre-empted and in some cases remotely resolved. Wearables and in-vehicle infotainment will experience vast growth thanks to the developments in the smartphones. Just as your router is the hub of your home, your smartphone can be the hub for all your connected devices on the move. 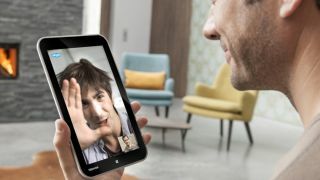 Tablet and laptop manufacturers will look to embedded connectivity to differentiate themselves and form a closer, ongoing relationship with the customer post sale. In M2M, the big legacy markets such as smart metering and Vehicle telematics will continue to thrive on a volume of connections basis but the interesting markets are those emerging due to the greater accessibility of fast mobile data. Digital Signage, CCTV and Wi-Fi backhaul/backup are just a handful of markets that have experienced a boom thanks to the near ubiquitous access of fast 3G and 4G data and will continue to do so. M2M isn't about empty vending machines sending a text anymore, and for a business focussed on data like Three Wholesale that's great news. TRP: In your opinion, what are the most interesting M2M & IoT opportunities that are yet to be explored? TG: As device manufacturers, specifically those in the laptop and tablet market, strive to find new ways to compete whilst retaining and or increasing margins, embedded connectivity offers a very innovative solution with near endless possibilities. Customers want a seamless experience, they just want to get online with as few steps in between as possible. The challenge for device manufacturers is the need to have one embedded SIM that can deliver high speed data in multiple countries but at a competitive local cost. This enables the manufacturer to embed one SIM at point of manufacture, regardless of where that device may eventually end up around the globe. HP is leading a charge on this market opportunity but it won't be long before others launch their own propositions. In M2M, remote broadcasting is an interesting market that we've seen emerging. During the Olympics, our 3G network was used to stream broadcasts back to TV centres. With mobile networks only becoming faster, they become a credible and cost effective alternative to satellite broadcasting. TRP: What about the most interesting existing technologies that are in the market?